“I’ve Just Seen a Face” is a song by the Beatles. It appeared on their 1965 United Kingdom album Help! and in the United States on the Capitol Records version of the Rubber Soul album. 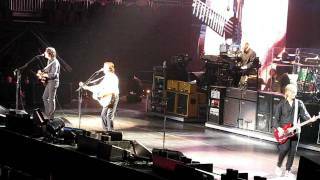 “I’ve Just Seen a Face” was written by Paul McCartney (credited to Lennon–McCartney) and features McCartney on vocals. Before its recording, the song was briefly titled “Auntie Gin’s Theme” after his father’s youngest sister, because it was one of her favourites It is one of very few Beatles songs that lacks a bass track. 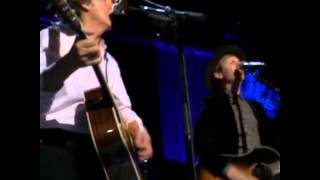 McCartney has stated, “It was slightly country and western from my point of view… it was faster, though, it was a strange uptempo thing. I was quite pleased with it. The lyric works; it keeps dragging you forward, it keeps pulling you to the next line, there’s an insistent quality to it that I liked.” Its lyrics sound effortless and conversational, but they also contain a complex sequence of cascading rhymes (“I have never known/The like of this/I’ve been alone/And I have missed“) that is responsible for the song’s irresistible propulsion. According to music critic Richie Unterberger of allmusic, “Several songs on 1964’s Beatles for Sale, as well as “I’ll Cry Instead” from A Hard Day’s Night, had leaned in a country and western direction. But ‘I’ve Just Seen a Face’ was almost pure country, taken at such a fast tempo that it might have been bluegrass if not for the absence of banjo and fiddle.” Music critic Ian MacDonald said the up tempo song “lifted the later stages of the Help! album with its quickfire freshness.” Capitol Records chose it as the lead track for the US edition of Rubber Soul with the intent of giving the album a stronger acoustic feel, in step with the then-current folk-rock movement. The song was recorded by the Beatles on 14 June 1965 at Abbey Road Studios in London in the same session with “Yesterday” and “I’m Down“. A voice can just be heard in the decay at the end of the song in mono [a] but not in [b] or [c]. The new mix [c] has reverb not found in [a] or [b]. Capitol added an unusual amount of echo to the mono mix [a]. “I've Just Seen A Face” has been played in 246 concerts and 16 soundchecks.